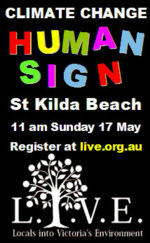 The Human sign event was held on Sunday 17 May at St Kilda Beach in Melbourne, Australia. The message was "Climate change - our future is in your hands". The catch-cry was devised by Sophie Dickinson, 11, a grade six student at St Michael's Grammar in St Kilda. 5000 people gathered to form the sign to highlight their frustration at a lack of action by Federal and State governments to reduce carbon emissions and tackle climate change. The protest was organised by community groups led by Locals Into Victoria's Environment, with many other local Climate Change Action Groups participating. 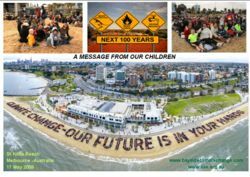 Organiser Coni Forcey from the Bayside Climate Action Group said the 350-metre human sign was a protest against the Government's "pathetic" minimum 2020 greenhouse target of a 5 per cent cut in greenhouse emissions below 2000 levels. She said Prime Minister Kevin Rudd had failed to live up to expectations before the 2007 election that he would be a world leader on climate change. "We seem to be setting up more barriers rather than really allowing renewable energy to flourish," Ms Forcey said. This page was last modified 14:06, 25 June 2009.